I want to turn a 5kW Motor on and off with an Arduino. The motor is connected to a Siemens Sirius Soft starter, which should make the task relatively painless. Switch/Signal: if set to 24V, then the motor will be running, if set to GND, then the motor stops. Because the Arduino runs on 5V, but the Softstarter needs a 24V signal, so I thought it would be a good idea to use a darlington transistor. Unfortunately, this does not work. I set the Pin11 to HIGH, but the Emitter leg of the dalington still still has a GND Potenial. I searched the internet and found your video on youtube. Now I suppose that the problem is caused by the fact that I am using the wrong type of Darlington transistor. The TIP120 is not suitable for a source configuration. A TIP125 would be a better choice. Is this the reason my schema does not work? Any other thoughts? A Darlington pair is a BJT driving a second BJT. It is intended to help drive the 2nd BJT into saturation (fully turned-on) when the input current isn't strong enough. (Current into the first BJT is multiplied into the 2nd BJT, turning it on "harder.) A BJT isn't needed in this application, nor will a single BJT work. Remember that BJTs need current to flow in order to turn on. My guess is that the input to your controller doesn't sink enough current to turn on the BJTs. Here's how I would do it with an NPN and a P-Channel MOSFET. Connect the Arduino input to the BJT's base resistor. 0 volts at the base will turn off the BJT, which drives the collector to 24 Volts. That puts 24 Volts on the Gate of the P-FET. So that Vgs = 24V - 24V = 0V, turning it off. 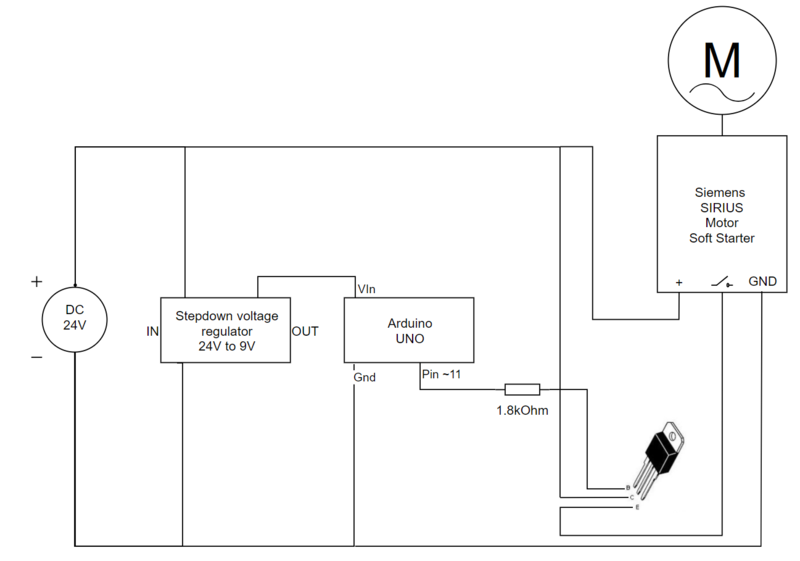 This circuit should provide your 0 and 24 volt for the controller. Just make sure the NPN's Vce is rated for >24 volts and the P-FETs Vds > 24 volts and you'll be good.